Polyclonal antibody raised in rabbit against histone H3 the monomethylated lysine 79 (H3K79me1), using a KLH-conjugated synthetic peptide. ChIP assays were performed using HeLa cells, the Diagenode antibody against H3K79me1 (cat. No. CS- 082-100) and optimized PCR primer pairs for qPCR. Chromatin from 1.6 million cells was sheared with the Diagenode “Shearing ChIP” kit (cat. No. kch-redmod-100). ChIP was performed with the “OneDay ChIP” kit (cat. No. kch-oneDIP-060). IgG (5 μg/IP) was used as a negative IP control. The IP’d DNA was analysed by qPCR using primers for different positive and negative loci. The results are expressed as a % of input (the relative amount of immunoprecipitated DNA compared to input DNA after qPCR analysis). Figure 1A: recovery of the GAPDH promoter and myoglobin exon 2 with a titration of the H3K79me1 antibody consisting of 5, 10 and 15 μl per ChIP experiment. 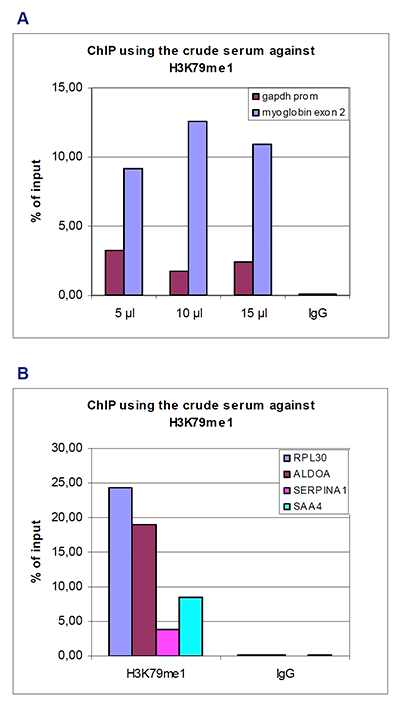 Figure 1B: recovery of RPL30, ALDOA, SERPINA1 and SAA4 using 10 μl of antibody per ChIP experiment. To determine the titer of the antibody, an ELISA was performed using a serial dilution of Diagenode antibody against H3K79me1 (cat. No. CS-082-100) in antigen coated wells. The antigen used was a peptide containing the histone modification of interest. By plotting the absorbance against the antibody dilution (Figure 2), the titer of the antibody was estimated to be 1:30,000. 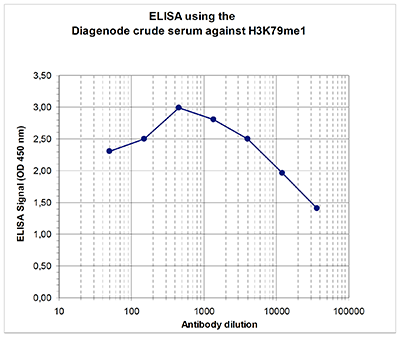 A Dot Blot analysis was performed to test the cross reactivity of the Diagenode antibody against H3K79me1 (cat. No. CS-082-100) with peptides containing other modifications of histone H3. These include di- and trimethylation of the same lysine and mono-, di- and trimethylation of lysine 9, 27 and 36. One hundred to 0.2 pmol of the peptides were spotted on a membrane. The antibody was used at a dilution of 1:100,000. Figure 3 shows a high specificity of the antibody for the modification of interest. 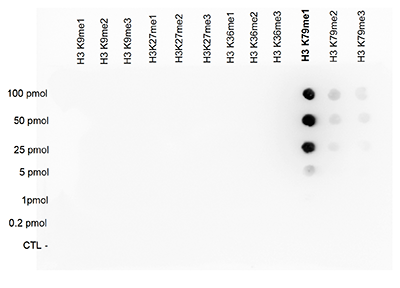 Western blot was performed on histone extracts from HeLa cells (15 μg) with the Diagenode abtibody against H3K79me1 (cat. No. CS-082-100), diluted 1:1,000 and 1:2000 in TBS-Tween containing 5% skimmed milk. The molecular weight marker (Bio-Rad, broad range biotinylated SDS-PAGE standard) is shown on the left, the location of the protein of interest is indicated on the right. 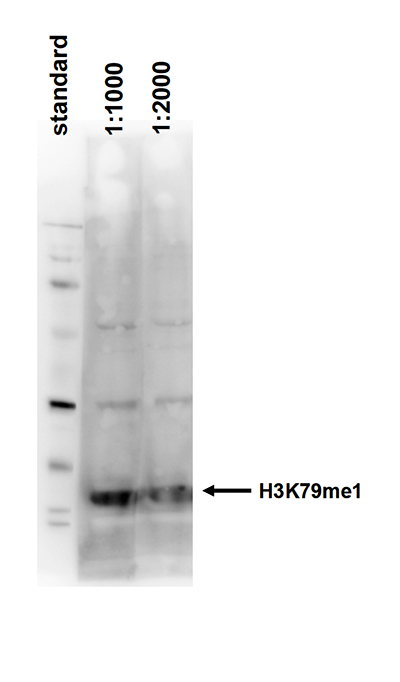 Diagenode strongly recommends using this:	H3K79me1 polyclonal antibody - Classic (Diagenode Cat# C15310082 Lot# A82-001 ). Click here to copy to clipboard.